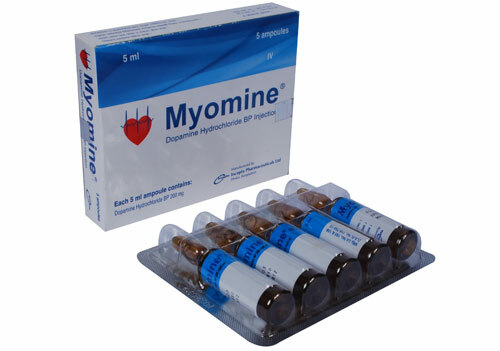 Each 5 ml ampoule contains Dopamine Hydrochloride BP 200 mg.
Dopamine Hydrochloride Injection BP is a clear and colorless solution for intravenous infusion after dilution. Dopamine hydrochloride can stimulate alpha, beta and dopamine receptors. At infusion rates of 0.5 to 2 micrograms/kg/min, dopamine receptors are selectively activated and blood pressure either does not change or decrease slightly. The most important effects are renal and mesenteric vasodilatation. Renal plasma flow, glomerular filtration rate and sodium excretion usually increase. At infusion rates of 2 to 10 micrograms/kg/min, beta1-receptors are activated and cardiac output and systolic blood pressure increase. • Acute hypotension or shock associated with myocardial infarction, endotoxic septicaemia, trauma and renal failure. • As an adjunct after open heart surgery, where there is persistent hypotension after correction of hypovolaemia. • In chronic cardiac decompensation as in congestive failure. Dopamine is a potent drug. It must be diluted before administration. Rate of administration: Administration at rates greater than 50 micrograms/kg/minute has safely been used in advanced circulatory decompensation states. If unnecessary fluid expansion is of concern, adjustment of drug concentration may be preferred over increasing the flow rate of a less concentrated dilution. Dosage: Begin administration of diluted solution at doses of 2 to 5 micrograms/kg/min in patients who are likely to respond to modest increments of heart force and renal perfusion. In more seriously ill patients, begin administration of diluted solution at doses of 5 micrograms/kg/min and increase gradually using 5 to 10 micrograms/kg/min increments up to 20 to 50 micrograms/kg/min as needed. In patients who do not respond to these doses with adequate arterial pressures or urine flow, additional increments may be employed in an effort to produce an appropriate arterial pressure and central perfusion. If doses of dopamine in excess of 50 micrograms/kg/min are required, it is suggested that urine output be checked frequently. Should urine flow begin to decrease in the absence of hypotension, reduction of dosage should be considered. Once optimal haemodynamic effects have been achieved, the lowest dose that maintains these effects should be used. Multiclinic trials have shown that more than 50% of the patients were satisfactorily maintained on doses of dopamine less than 20 micrograms/kg/min. Do not add Dopamine to any alkaline diluent solution, since the drug is inactivated in alkaline solution. Patients who have been treated with monoamine oxidase (MAO) inhibitors prior to the administration of dopamine will require substantially reduced dosage. Hypovolaemia should be fully corrected prior to treatment with dopamine with a suitable plasma expander or whole blood or plasma. Pregnancy: It is not known whether dopamine crosses the placental barrier. The benefits of using this product should be weighed against the possible risks to the foetus. Lactation: It is not recommended for breast-feeding mothers unless the expected benefits outweigh any potential risks.